France’s DOLLS RAIDERS (formally Iron Cobra) have crafted a rather unique album in “Free Yourself”, out December 14th, 2018 via Mighty Music. We get a rather wide range of sounds from glam, hard rock, classic rock, and even mid 90’s alternative rock. All with a nice splash of metal. Vocalist Nicolas was difficult to pinpoint. He has his own vocal style that arguably teetered into Mike Patton territory mixed with Chris Robinson of the Black Crowes. I say this lightly, as he does not necessarily sound like them, but merely an idea of them. 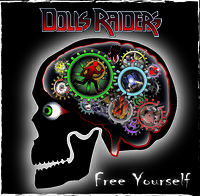 Rounded out by Christophe on guitars, Claude on bass, and Richard on drums, DOLLS RAIDERS have a statement to make with their debut album “Free Yourself”. Opener “Bad Morning” starts off with a Van Halen inspired guitar riffs. Which there are some pretty boss riffs on this song courtesy of guitarist Christophe. It’s driving, rocking and fun. “Be Positive” has that classic mid-tempo glam sound. Oddly enough, it sounds like it could have also come out in the early 90’s. “Burn Your TV” has a southern rock motif going. Again vaguely reminiscent of the Black Crowes. “Take the Time” is a more energetic number that has a fun chorus and is a stand out track. Mid way through the album we get a ballad “Real Love”. This is your obligatory ballad however, rather bland and nothing standing out ultimately. “Dolls Raiders” starts off promising but never seems to go anywhere. Vocals and guitars are uninspiring while the song bides its time to get started. Title track “Free Yourself” was a bit of a slow burn that changes dramatically on the second half that is chock-full of energy all while boosting a rocking solo. Closing track “Taste of Shame” has a much heavier 80’s glam feel. Nicolas’ vocals are exceptional and Christophe’s guitars shine. Very much a party tune akin to something Mötley Crüe or Skid Row would do. Easily one of the best tracks on the album. DOLLS RAIDERS’s debut album “Free Yourself” is not perfect by any means. However, there are enough strong tracks that fans of 80’s glam, hard rock, Skid Row, L.A. Guns, and alternative rock would take interest. Christophe is clearly a talented guitarist and often times his approach really stands out. I would have liked each song shorter rather than the five-minute average mark. Also, Nicolas’s vocals seemed muddled in the mix, which also affected the entire sound. Those are my major gripes from the album. Overall, “Free Yourself” is plagued by filler tracks that hinder the album. All is not lost however, as there are a solid five tunes that will get the listener fist pumping and going.